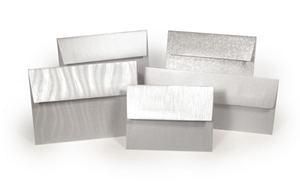 ASPIRE Petallics specialty envelopes are a dazzling line of two-sided metallic envelopes. The striking colors of ASPIRE Petallics are inspired by the petals and metals of our beautiful continent. Envelopes are stocked in a wide variety of popular sizes and special sizes can be manufactured upon request. Projects: Perfect envelopes for card making, direct mail, invitations, greeting cards, holiday cards, wedding invitations and all graphic design projects. Kromekote Jade specialty envelopes The luster of each of the four embossed surfaces appeals to the eye and the hand. Combine great design with any one of these extraordinary mica coated textures and watch as standard inks ignite and images leap from the page. The unique finish of Kromekote Jade was developed for optimal offset printing production and is also suitable for laser and toner applications. 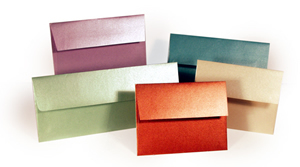 Glama Kraft specialty envelopes are an innovative line of natural envelopes designed for full color printing. Glama Kraft is available in many popular sizes and two color options of Grey/Grey (with grey inside) and Brown/Grey (with grey inside). 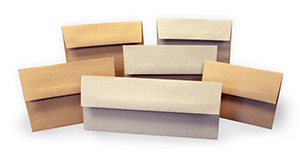 Glama Kraft envelopes are 100% recycled with 90% Post-Consumer Waste (PCW) and FSC Certified. Projects:Perfect envelopes for card making, direct mail, invitations, greeting cards, holiday cards, wedding invitations and all graphic design projects. 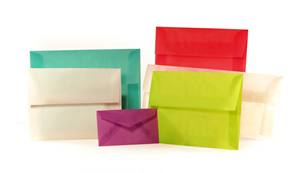 Glama Natural specialty envelopes are North America's leading line of natural translucent envelopes. Glama Natural is known for its superior translucency, fiber formation, foldability and strength characteristics, which make it an outstanding choice for envelope converting. Envelopes are stocked in a wide variety of popular sizes and special sizes can be manufactured upon request.